Racing season is upon us once again! I’m looking forward to the cooler temperatures and fun races. 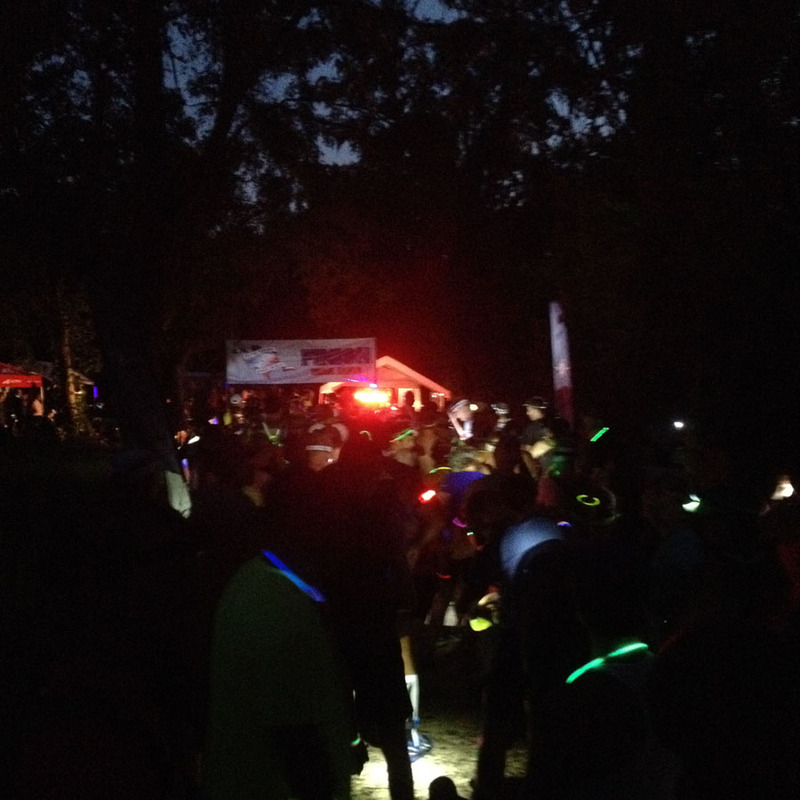 I’ve been doing a lot of trail running lately, so it seems fitting that my first race of the season was the Night Moves Trail Races half marathon. 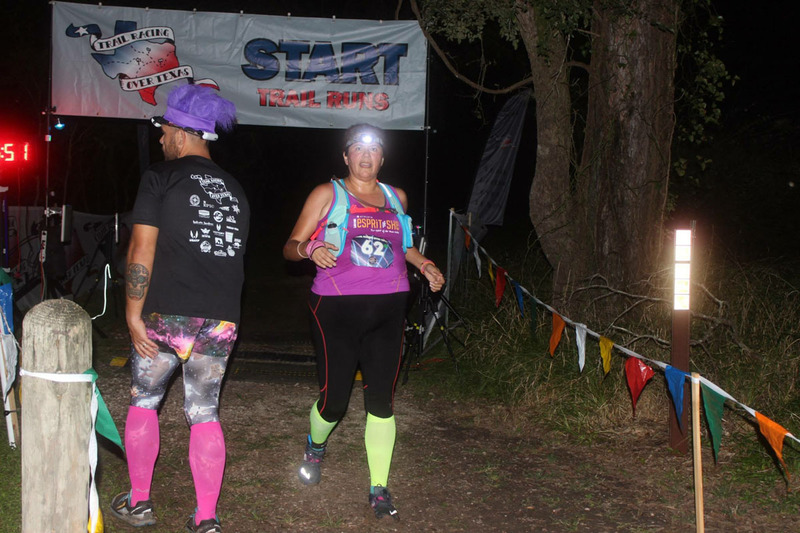 This race was run through the lovely trails of Stephen F. Austin State Park, and, as the name suggests, at night. Waldo and I arrived at the park in the early afternoon because I wanted to get a feel for the course. I have never been to this park, and I wanted to familiarize myself with the trails. After pickup up my race packet and checking in, we walked the trail to the second aid station, where Waldo would be volunteering. That location is incredible. 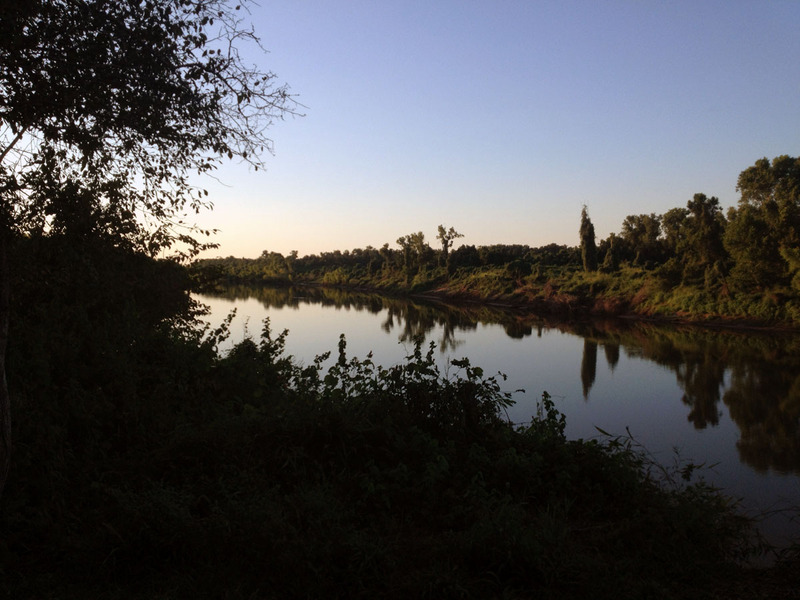 As we sat on the benches overlooking the Brazos River, the dozens (yes, dozens!) of hummingbirds flittering around the Turk’s cap kept us entertained. After taking in the scenery, I headed back to the car to get ready for the race. I dressed my toe, which has yet to fully heal from the Habanero Hundred, and added some preventative measures to known hot spots. On the walk I noticed a water crossing, and with the rains the week before, there were some muddy spots. I also found a geocache that was hiding in plain sight. That was cool. Start time was 8 p.m., so I made my way to the start at around 7 p.m. 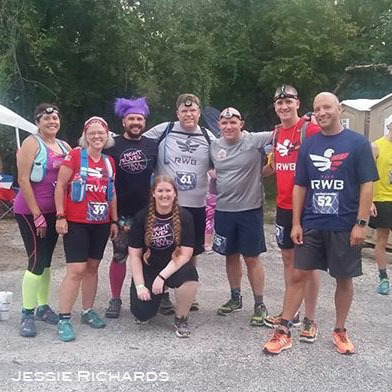 I met up with fellow Team RWB Eagles, and chatted with a college friend and another trail race regular. The RD gave us the skinny on the course: three water crossings and about half a mile of mud to get through after the second aid station. It didn’t sound too bad. The race was four laps of ~3.6 miles. There were also 5K and 10K races happening at the same time (staggered starts). My only hope was that my toe would hold up well enough for me to finish. Lined up at the start, almost everyone was decked out in glow sticks or neon lights. The race was 80s themed, and there were a lot of cute, fun costumes. This and the disco ball at the start/finish line made for a colorful evening. I loved the festive vibe at this race! The first lap went well (16.26 m/m). I started out at the back of the pack, and kept an easy pace to ease my toe into the run. It seemed to do well for the first half of the loop. The course was in good condition with only a couple of muddy spots. I got to the second aid station, and popped in to grab some pickles because my calves were cramping a little. I continued on, knowing the back half would be the true test. I was able to jump the first stream we came across, so that kept my feet dry for a bit longer. The next two water crossings were unavoidable. Luckily, my PureGrit trail shoes drained very well so my feet didn’t feel soaked. The mud was a different story. Heavy, sticky mud. I didn’t stop though. I ran through it like I’ve seen faster runners do, and I was able to get through with very little problems! Who knew? My shoes did hold on to the mud though so it felt like my feet were 20 lbs heavier. I had to stop several times to shake it off. Lap 2 was similar to the first (18.33 m/m). Except my toe dressing started to feel like it got loose from the water. I ended up stopping at the second aid station to redress and change socks. This ate up quite a bit of time, but I’m glad I stopped. I was able to secure my bandage even better than before. Also, I kept my PureGrit shoes because my other trail shoes don’t have the grip that I needed for the muddy sections. I decided to “speed” walk loop 3. I had already worked through my calf cramps, and my dressing was feeling good (it survived the water), but my toe was sending up some mixed signals. I slowed it down (17 m/m) to let things settle. At the second aid station, I ran into my college friend again. She wasn’t feeling well, so we walked at a casual pace (~26 m/m). She ended up being sick on the trail about a mile out from the finish. Thank goodness it was her last loop. I averaged 21.9 m/m for loop 3. Lap 4, and I wanted to be done. After leaving my friend, I picked up the pace again to ~15 m/m (15.8 m/m avg for the loop). My legs were feeling pretty good after the walk so I ran the first half through. I stopped one last time at the second aid station to get a water refill. According to Waldo, I was about five minutes behind the previous runner, so I made it my goal to catch up. And I did! We ran the final mile together, and as we made the final turn to the finish, I challenged him to a sprint. We both took off running and came in at the exact same time. I was so happy to see the disco ball for the last time.